A special merci beaucoup (thank you very much) to Yves Guilleux for supplying GC standings down to 10th place for each stage. Returning Giro champion Miguel Indurain won the 1993 Giro his standard way, he contained his opponents in the mountains and crushed them in the time trials. Piotr Ugrumov refused to accept Indurain's hegemony and repeatedly attacked the Spaniard. In the penultimate stage Indurain finally cracked under Ugrumov's hammer blows, but didn't lose enough time to give up the lead. A second Giro d'Italia was his and in July he would win the Tour, giving him two consecutive Giro/Tour victories. Americo Neves da Silva s.t. This Giro had a good helping of foreign teams: Telekom from Germany; Motorola from the U.S.; Kelme, a Spanish team mostly made up of Colombians; GAN from France; Festina, registered in Andorra but with riders from all over; Artiach and Banesto from Spain. They would be competing in what was regarded as one of the hillier Giri in recent history. Bugno’s 1992 had been creditable with a third in the Tour and a second consecutive World Championship, but the days when he could win almost at will seemed to have passed. 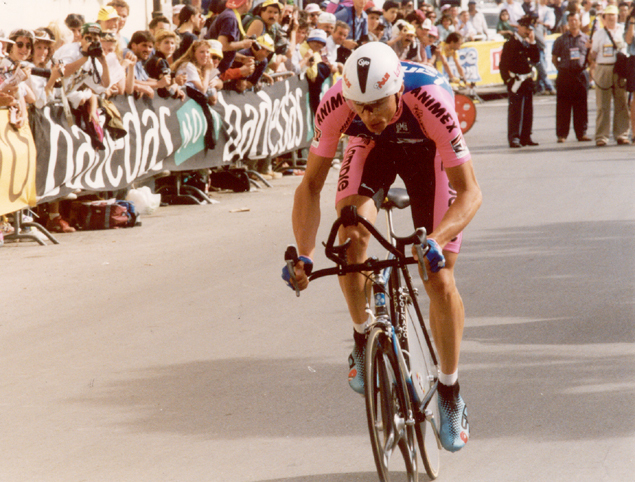 That ability was present in the returning Giro champion, Induráin, who had followed up his 1992 Giro win with a commanding Tour victory, putting him in the elite club of Giro/Tour winners Coppi, Merckx, Hinault and Roche. Induráin caught a lot of grief from his countrymen for taking a pass on the Vuelta to again ride the Giro. But at the time, the Giro was still ridden what might be called Italian style, with the riders going at a moderate tempo until the last hour, which was raced all out; perfect training for the Tour. Greg LeMond was also hoping the Giro might again bring him to top form. The first day of racing was on the island of Elba, off the coast of Tuscany, where Napoleon had been sent for his first exile. It was a split-stage day with the first half an 85-kilometer road race to Portoferraio. Moreno Argentin left a small breakaway on the final climb and soloed in with a 34-second advantage on the field. What was most interesting about the stage was that once it was clear that Argentin’s break was looking good, Induráin had his team start bringing it back. Induráin was already riding the Giro as if he were the leader. The afternoon 9-kilometer time trial was won by Maurizio Fondriest with Induráin only two seconds slower. Upon landing in the Tuscan coastal city of Grosseto, the Giro headed southeast. By the end of the third stage with its uphill finish in the small town of Scanno, the race was due east of Rome. Argentin’s Mecair team pulled a smart move. Rather than putting the team at the front to ride tempo all day to police the pack, Piotr Ugrumov was sent to join a break. The gambit was successful. Ugrumov jetted from the escape to a solo win. Induráin was forced to put his team to work controlling the break while Argentin’s Mecair riders sat in and enjoyed the ride, not needing to chase down their own teammate. Ugrumov was now in second place. As the race headed south for three days of racing in Sicily under a terrible baking sun, the top of the leaderboard didn’t change. The race transferred to Montelibretti, near Rome, for a race to Fabriano in Le Marche. Again, no changes to the important standings nor any meaningful action. That would end with the stage ten 28-kilometer individual time trial in Senigallia. Induráin simply smashed the other hopefuls, beating Argentin by a minute while Ugrumov lost 65 seconds. Bugno’s performance was poor enough to effectively remove him from contention. The next day’s stage went from the Adriatic coast to the hilltop town of Dozza, near Imola, and was ridden in a terrible downpour. A fuga di bidone was allowed to get a sizable gap; Fabiano Fontanelli led in the first of the scattered breaks 3 minutes 29 seconds ahead of the Induráin group. That led to a slightly reordered General Classification because some of the members of the break were not far down in time. Leali and his Mercatone Uno team had their hands full defending the Pink Jersey. Stage twelve went to Asiago with a second-category climb in the way, and as soon as the racing started, so did the attacks, and they kept coming and coming. A small group did escape, but despite all of the day’s action, the contenders finished together. After the stage, Stephen Roche said that there were two races, one for the maglia rosa, which was already partly conceded to Induráin, and one for the first Italian, something that is usually true of any national tour with a dominant foreigner. Some observers thought Induráin looked less than his usually all-powerful self, but to this writer he looked the same, not bothering to waste a single watt and content to let Leali’s Mercatone Uno squad do all the work of controlling the race. Stage thirteen might not give him that luxury. It was the first Dolomite stage with two hard passes near the end of the day, the Passo di Eores and the Passo delle Erbe before arriving in Corvara. On the Eores a couple of small groups escaped and halfway up Andy Hampsten jumped, with Ugrumov and Massimiliano Lelli coming along for company. The three stayed together with Hampsten doing the lion’s share of the work and Lelli doing none. Further back, seeing that Ugrumov was the virtual Pink Jersey, Mercatone Uno worked like dogs to minimize the gap. Throughout most of the stage Leali remained glued like a limpet to Induráin. After the Erbe, the Hampsten trio still had over a minute. Induráin’s Banesto riders threw their weight into the chase and then finally Induráin and Leali started working the front, there being no sense in toying with a threat like Ugrumov. As the break closed in on the finish at Corvara, Gianni Bugno jumped away from the chasers and bridged the gap to the lead trio. The pack caught the break just at the line allowing Argentin to win a second stage. Confounding the experts, Leali kept his lead for another day. If Leali thought defending the lead in stage thirteen had been difficult, stage fourteen looked even more daunting. The day’s racing served up several category one climbs, generally the hardest rating in the Giro: the Costalunga, two ascents of the Pordoi, the Marmolada and the Campolongo. Moreover, the day was brutally long at 245 kilometers. Several riders, including Bugno—under intense pressure from the press to perform some sort of epic exploit—escaped before the Marmolada. On that almost interminable climb, the Spaniard looked for no help while setting such a hot pace that by the time his small group went over the top all the escapees had been reeled in and the few riders who remained with him looked to be holding on like grim death. Bugno had gone too deep for too long on the Marmolada and by the time he reached the crest he was pedaling squares with exhaustion written on his face. On the second crossing of the Pordoi, Induráin had Lelli, Poulnikov, Chiappucci, Pavel Tonkov and Ugrumov with him. Thirty-two seconds back, Hampsten was in a small group with Fondriest, who was desperate to get back on terms with the leaders. Through the rain they chased, but at the top of the Pordoi the gap had grown from 32 seconds to over a minute. In trouble, Leali crested over four minutes after Induráin. The Induráin group stayed away with Chiappucci winning the sprint after 7 hours 27 minutes of hard racing. Ugrumov was gapped at the end by 20 seconds and Induráin was back in pink. The Giro headed out of the Dolomites and turned west. On the eighteenth stage, a young rider on Chiappucci’s squad named Marco Pantani abandoned his first Giro. 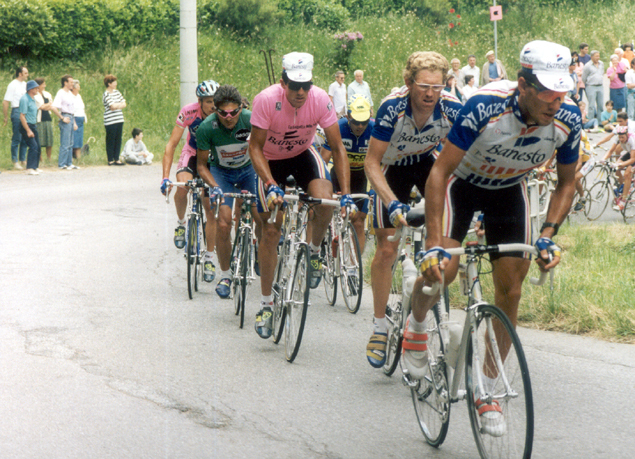 Indurain in pink with Claudio Chiappucci (in green jersey) on his wheel. There were no mighty Alpine stages scheduled, but stage nineteen was a 55-kilometer uphill time trial to Sestriere. This was one of the last two chances to upset Induráin and it was on his own turf, a race against the clock. True to form, Induráin won the stage and extended his lead. Ugrumov, showing that he deserved second place in the General Classification, was second in the time trial. Ugrumov wasn’t giving up. The penultimate stage had a ten-kilometer climb to its hilltop finish at Oropa. Ugrumov attacked and attacked, trying to bludgeon the Spaniard into submission, and each time Induráin closed the gap. Induráin detested these constant accelerations and looked to be tiring. Finally Ugrumov let loose another bolt of speed and Induráin could not resist. He had cracked. As Induráin slowed, Chiappucci and several riders who had been dropped sped by. Ugrumov dug deep, trying to erase the 94-second gap that separated him from the Pink Jersey. But at the top, he fell short by 58 seconds.That made two Giri in a row for the Spaniard.